When recently contemplating my favorite comic-book companies that are gone but not forgotten, I knew early on that all my top choices would be publishers from before I started working in the industry. What sort of surprised me when I got to choosing the comics outfit I missed the most was that it was the American Comics Group, best known as ACG to the fans of the 1960s. When I reading their comic books in the 1960s, there were only four ACG titles: Adventures into the Unknown, Forbidden Worlds, Unknown Worlds and Herbie. Almost every story and maybe every story in those issues was written by editor Robert E. Hughes utilizing a variety of aliases. The “voice” of Hughes was also evident in the letters page where he was never afraid to challenge readers if he felt they didn’t appreciate a story he thought was great or praised a story he felt was one of his weaker efforts. He even faced down trolls who wrote insulting letters to his comics. Yes, there were trolls back then. We just didn’t call them that. Hughes also had a knack for making average and even mild-mannered characters the heroes of his stories. I never got tired of seeing some put-upon schlemiel rise up to a challenge and change his life for the better. As veteran readers of my work know, I’m a sucker for a good redemption tale. For some time now, the UK-based PS Artbooks has been reprinting both Adventures into the Unknown and Forbidden Worlds in hardcover editions. At great peril to my checking account, I’ve been buying and enjoying them. My latest was Forbidden Worlds Volume Twelve [$59.99], which reprints issues #71-76, cover-dated October 1958 to March 1959. There are many highlights in those issues. Ogden Whitney drew all six covers. An underrated talent, Whitney’s cast of characters – you would see similar types on his covers and his interior stories – were realistic representations of ordinary human beings. Exactly the sort that would serve as the protagonists in Hughes’ stories. However, it was not just human beings who showed surprising courage or learned important life lessons in these tales. 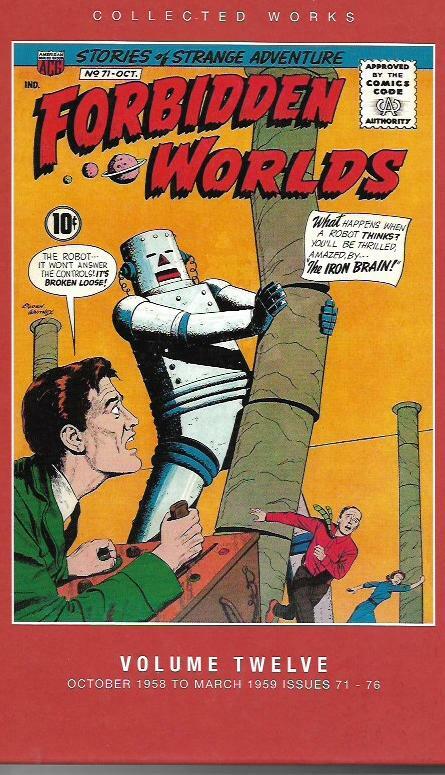 “The Iron Brain” was a robot who developed independent thought and wanted to be accepted by the humans around him. It wasn’t a unique concept for a story, but Hughes and artist Mike Roy told it in such a way as to make the characters, even the robot, very real. There are some amazing artists in these issues. Many of them were and remain underrated, but there are stellar turns by John Forte, Paul Reinman and John Rosenberger. A story drawn by John Buscema is indicative of his amazing talent, and even Al Williamson shows up for a story. Solid, steady and sometimes sensational visuals were not at all alien to ACG’s comic books. The highlight of this particular volume is “Herbie’s Quiet Saturday Afternoon” by Hughes and Whitney. This is an early adventure of the stout young hero with thick glasses who is generally considered to be ACG’s best continuing character. Right from the start, this kid was clearly a star. As long as PS Artbooks reprints these wonderful ACG comic books, I will continue buying them. They might be dangerous to my financial well-being, but they delight my soul. Escape from Monster Island [Zenescope; $15.99] could be an above-average movie of the sort beloved by creature-feature afficinados. The premise is that the U.S. Government has been capturing dozens of species of “monsters”, keeping their existence secret from the public and imprisoning them on an island for experimental purposes. Yes, experimenting on these creatures is monstrous, so labeling the test subjects as “monsters” is definitely calling the kettle black. The monsters pretty much took over the island a few years back and all that’s keeping them from going beyond the island is the force field that locks them in. But the force field is failing, an elite mercenary squad is being sent it to recover vital research and the military wants to nuke the island as soon as the force field stops working. The clock is definitely ticking. Written by Joe Tyler from a story by Joe Brusha and Ralph Tedesco, Escape is entering. 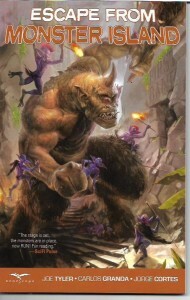 Some of the characters – human and “monster” – are well developed. Others are little more than cannon fodder. This graphic novel, which collects the six-issue comic-book series, has exciting action, scary “monsters” and surprising twists. The Carlos Granda art is excellent, both in the actual drawings and in telling the story in a visually smooth manner. Best of all, the adventure has a satisfying ending, something that still seems to be a great challenge for many comics creators. Escape from Monster Island isn’t an award-winning comics work, but it is a solid and enjoyable tale. I recommend to my fellow monster-movie fanatics. And, hey, if you’re a movie maker with a reasonably decent budget, you might want to take a look at this book for your next film. Speaking of comics with unsatisfying endings, not to mention a heap of other shortcomings, I give you Civil War II [Marvel; $50]. Let me amend that. I wouldn’t give you Civil War II on account of we’re friends and friends don’t hurt each other that way. 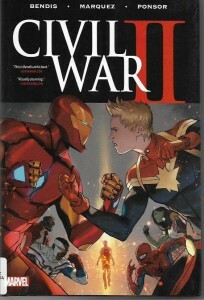 Collecting Civil War #0-8 and a story from Free Comic Book Day 2016 (Civil War), this hardcover book is another sad example of Marvel shooting itself in the crotch for shock value. Yeah, I know “foot” is the usual target, but, hey, shock value. Did it work? Ulysses, a new Inhuman, seems to have the power to tell the future with certainty via the horribly realistic visions he receives and “lives” through. Which is enough for Carol Danvers (Captain Marvel) and other wannabe totalitarians to start locking up people because Ulysses says so. They aren’t locking up people for crimes they’ve committed. They’re locking up people because one man – one man – is saying they will commit those crimes. Which is all fascist Captain Marvel needs to upend constitutional and moral rights. Even after she’s given evidence that Ulysses may not be batting the thousand percent she has been claiming. Congratulations, Marvel. I’ll never be able to think of Carol as a hero again. Maybe it’s time to retire her and bring back Mar-Vell to assume the name of Captain Marvel. His being dead shouldn’t stop you. You threw logic out the window with this and so many of your other “big freaking event” series. Sidebar. There’s supposed to be a Captain Marvel movie. I sincerely hope the Marvel Cinematic Universe chooses to ignore Civil War II. It would be nice to have the real Carol Danvers up there on the big screen and not the evil twin of the comic books. Civil War II is not recommended for readers of any age. Even beyond the disastrous dismantling of Captain Marvel’s legacy, it lacks an ending that resolves any of the issues it raised. It simply takes Ulysses out of the equation. Disappointing.